Last week I discovered dragon fruit. My friend Sharon who is visiting Viet Nam posted a blog about it last week. Check it out here. Finding the fruit taste bland, Sharon put out a call for help. She wanted to add it to her healthy diet of chocolate and red wine, but only if it she discovers a way to give it more flavor. She asked her readers for serving suggestions. She told me that is a fruit like a kiwi, just eat it. If I was going to try dragon fruit, I wanted one that was in better shape. So later, I visited another ethnic grocery store and found a better specimen. 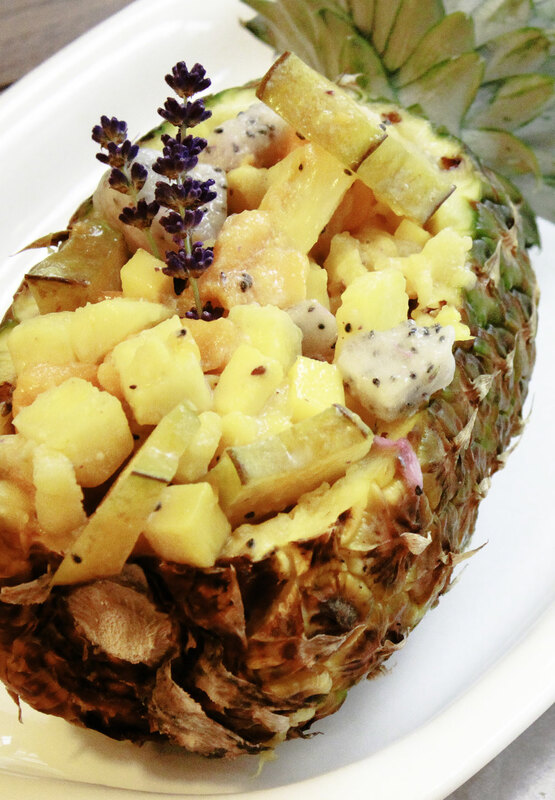 Searching the internet for “dragon fruit recipe”, I found a recipe for Tropical Thai Fruit Salad – Served in a Pineapple. A quick check of the ingredients satisfied my requirement that it contain dragon fruit. When I read the recipe for the dressing, I knew I had found the key for adding flavor. I was hopeful that in combination with pineapple, papaya, mango and star fruit, the dragon fruit would unleash its culinary personality. My favorite herb is renowned for adding flavor and waking up even the most mild fruit such as pears. What would happen if I added lavender to the coconut milk dressing? I sprinkled ½ teaspoon of ground lavender into the coconut milk mixture and poured the dressing over the fruit. A quick taste handed me the answer I was hoping for. The flavor combination complimented the tropical fruit medley. And never know I’m there. 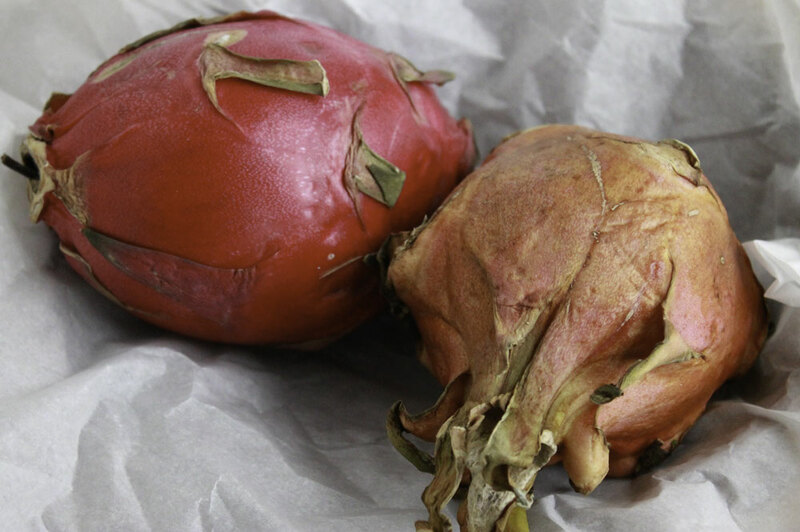 . .
Poor dragon fruit, once the showy red exterior is peeled away, it’s just like Mister cellophane. You never know it’s there. p.s. Sharon, I guess we will need to keep looking for a flavor boost for the dragon fruit. A strong storm hit Seattle yesterday and today. I sat at my dining room table this morning and watched the wind push around the hanging pots on my deck. A large cedar tree near the rear of our house bent over about 45 degrees, but withstood the wind gusts. Rain came down in sheets. Water streamed down the street like a river. Dark clouds filled the sky. I needed a strong, hot and steamy drink to warm me up and remind me of summer. So I brewed up some lattes infused with the flavor of lavender. After steaming milk, I added a 1/4 teaspoon of the Lavender Extract that I got from Lavender Wind Farm. This extract adds just a hint of flavor, a small reminder of summer on this dark, stormy day. Sipping my latte, I felt my spirits lift. 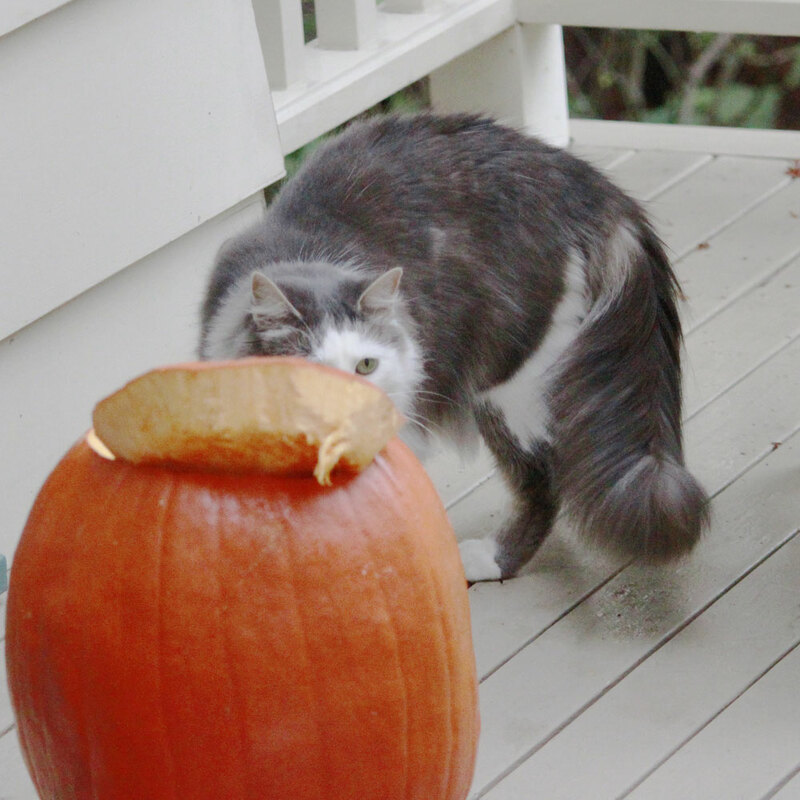 My neighbor’s cat came up on the deck to check out our Halloween pumpkins. Cats love lavender (catnip’s cousin), however I was surprised to see this calico beauty braving the wind and rain to get a close look at our soon-to-be Jack O’Lanterns. Last June I attended an event that was informative, inspiring and enjoyable. Northwest Perennial Alliance hosted Hardy Plant Study weekend on June 18th through June 21st. The program was packed with terrific speakers, celebrity gardeners and timely topics. However one of the speakers left a lasting impression on me. She inspired me with her enthusiasm for creating edible landscapes. Rosalind Creasy began her presentation with a story of how she fell in love as a child with gardening and later with food. Her presentation “Introduction to Edible Landscaping” attracted at least 100 people filling the large conference room. Creasy told about her first edible landscape. In the 1980’s while living in California, Creasy replaced her lawn with an edible landscape. Now her neighbors gather to share the bounty, the FedEx driver can’t resist helping himself to a juicy strawberry, and children are attracted to the big orange pumpkins. Easy access to fresh, organic and locally grown herbs, fruits and vegetables is an added bonus. Creasy enjoyed gardening from the time she was a child in Massachusetts. “My father gave me an array of vegetable plants for my small garden. The plants did not care for my tendency to move them around like I rearranged the furniture in my doll house.” Although her plants died, Creasy’s passion for growing food was born. As a young woman, Creasy’s love for food and cooking not only made her very popular with her husband and his MIT colleagues, but also sparked an interest in discovering unusual varieties of herbs and other ingredients. She cooked her way through Julia Child’s cookbooks even before Julie Powell. Then she tackled, the Joyce Chen Cookbook. Both Julia Child and Joyce Chen lived in Cambridge, where they each appeared on TV cooking shows. During Creasy’s visit to Israel, she experienced a compelling moment. Outside of Haifa on her way to visit a kibbutz, Creasy “was struck by how hard it was for the Israelis to grow food on the limited arable land in their country, which is mostly desert.” Creasy realized that Americans were missing an opportunity to grow at least some of their own fruits and vegetables in their yards. This was the moment when Creasy’s vision of edible landscaping came into focus. Creasy’s first book, The Complete Book of Edible Landscaping: Home Landscaping with Food-Bearing Plants and Resource-Saving Techniques, (Sierra Club Books, 1982). The book was a big hit and sold more than 140,000 copies, won the Garden Writers Association’s Quill and Trowel award, was chosen as a Book of the Month selection and was hailed by The Wall Street Journal as the best garden book of 1982. 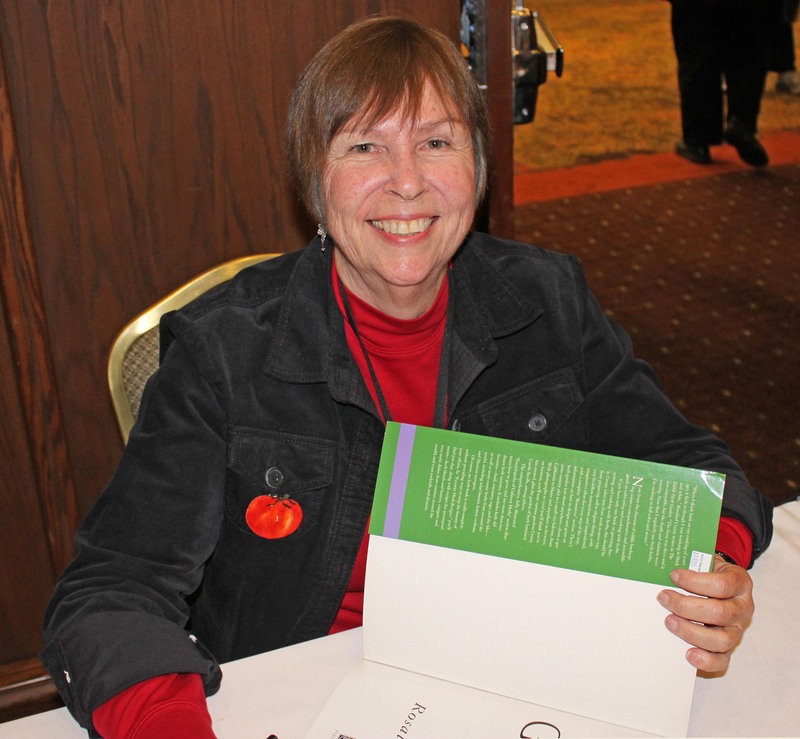 Creasy’s most recent book, an updated version of The Complete Book of Edible Landscaping, is titled Edible Landscaping (Sierra Club Books, 2010). The book will be available in stores November 2010.
p.s. Creasy has written 20 books. The books have vivid photographs created by Creasy. On a personal note, I own at least five of her books. If you love food and gardening, you will love these. When I was asked to speak to the Washington State Federation of Garden Clubs, I learned about the Bastyr University Medicinal Herb Garden. 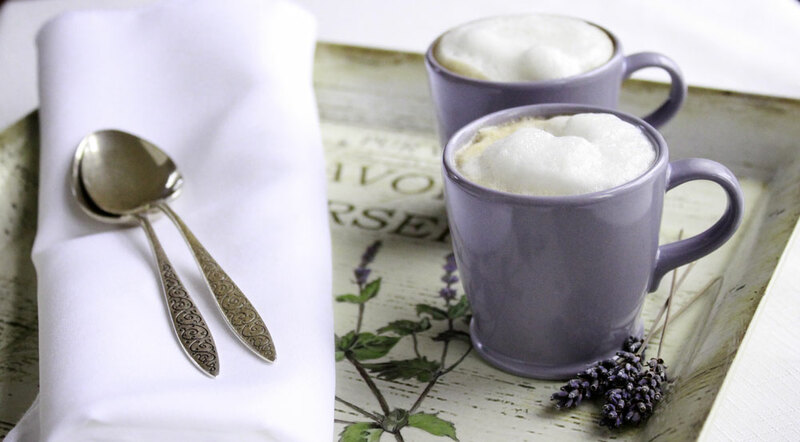 JoAnne Gold had invited me to come to this meeting and to talk about cooking with lavender. After my talk, she asked if I’d ever visited Bastyr’s herb garden and handed me a brochure with its hours, directions and how it is organized. I was impressed with her thoughtful kindness. I explained that I had always wanted to see it, but somehow never got around to it. 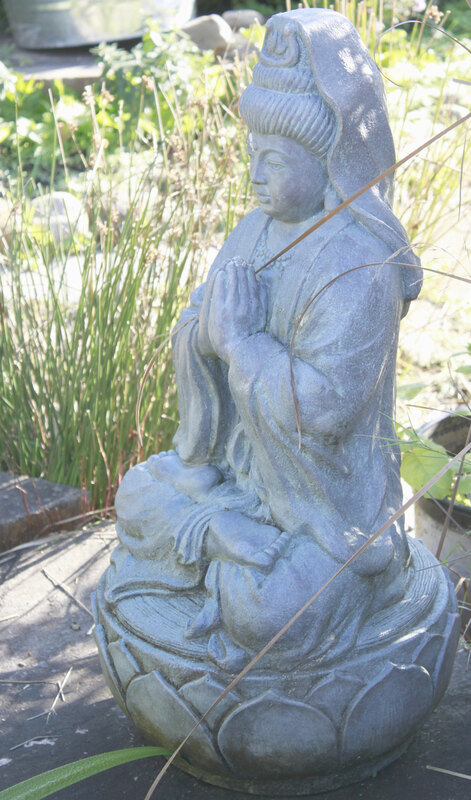 As I was thanking her, I pledged to set some time aside and visit the garden soon. Last Sunday morning with the October sun shining brightly, I drove to Kenmore, an east-side suburb of Seattle. Bastyr University’s building used to be St. Edward’s Seminary, an institution for developing Catholic priests. The Seminary closed in 1976. The State of Washington bought most of the property (316 acres). Bastyr University leased the seminary building in 1977 and in 2005 bought out their lease. I have a dim memory of visiting St. Edward’s as a child. When I think about that visit, I remember tall trees and vast green fields of lawn, maybe we were there for a family picnic. On Sunday, I was there to see the herb garden. The garden is divided into ten sections. The center of the garden is devoted to nine Physiological Systems Beds containing 100 key medicinal plants that support each body system. I looked around for lavender wondering where it would be classified. I’ve read claims about the health benefits lavender delivers to each of these systems. There it was in the section labeled “Brain and Central Nervous System.” I would have liked to hear the rationale for including it here. I’m guessing lavender’s ability to soothe the spirit, calm the nerves and induce sleep made it a prime candidate for this section. What were some of the other herbs that fell into this category? St. John’s Wort, Monkshood, Oats and German Chamomile are growing there along with lavender. 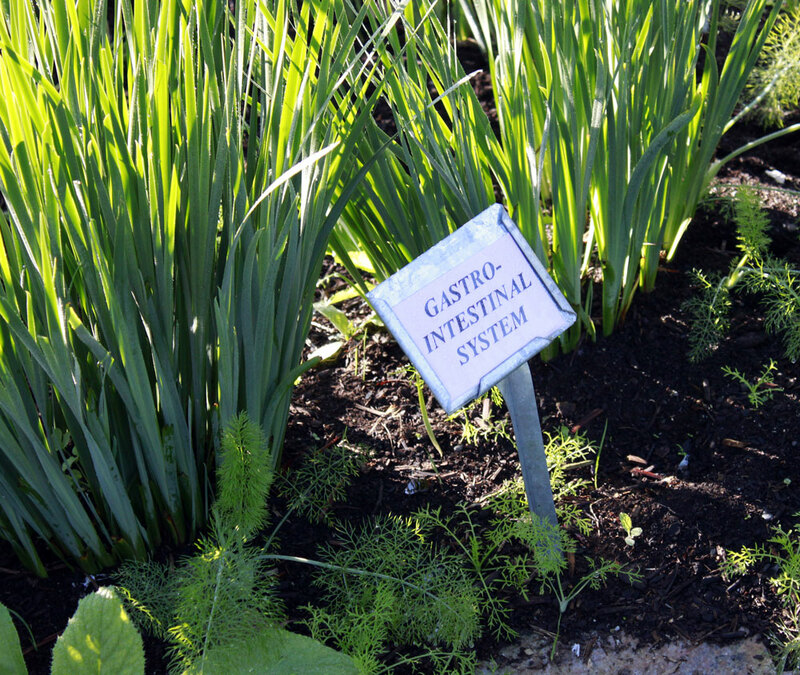 I am glad I’d visited this garden, it made me think more about the modern health system and how we’ve built an industry to create drugs for everything from insomnia to impotence. Our doctors tell us to take drugs to lower our blood pressure and reduce our cholesterol. Maybe these drugs do more harm than good, but I confess I’m a bit skeptical. Bastyr University gives me hope that educating people about their healing power of herbs will result in a more natural way to maintain our health. Soft, sweet, sticky whoopie pies are one of my many guilty pleasures. Until now, I’ve never made whoopie pies, however I do remember the chocolate cake sandwich filled with marshmallow cream. Funny, I don’t know where I got them, maybe a neighborhood bakery or corner store. I haven’t given whoopie pies a second thought since childhood. That is, until the November/December issue of my “WeightWatchers” magazine arrived a couple of days ago. Browsing through the magazine, I read the articles that inspire me to keep eating healthy food, in appropriate portions and give me ideas for increasing physical activity. This magazine always gives me new tips. Then I saw the whoopie pie recipe on page 70 for Peppermint Whoopie Pies. That recipe activated my appetite along with my memories of past whoopie pie affairs. Suddenly I was thinking about the song “Making Whoopee”. I could hear Ella Fitzgerald’s sultry voice singing the suggestive lyrics. Another victim is at her side. Turning back to recipes and baking, as I read this recipe, it triggered my imagination. I had recently purchased lavender extract from Lavender Wind Farm. What if I used that instead of peppermint extract when I made this recipe? I could replace the green food coloring in the filling with purple. Oh, I’m so happy with my version of whoopie pie. 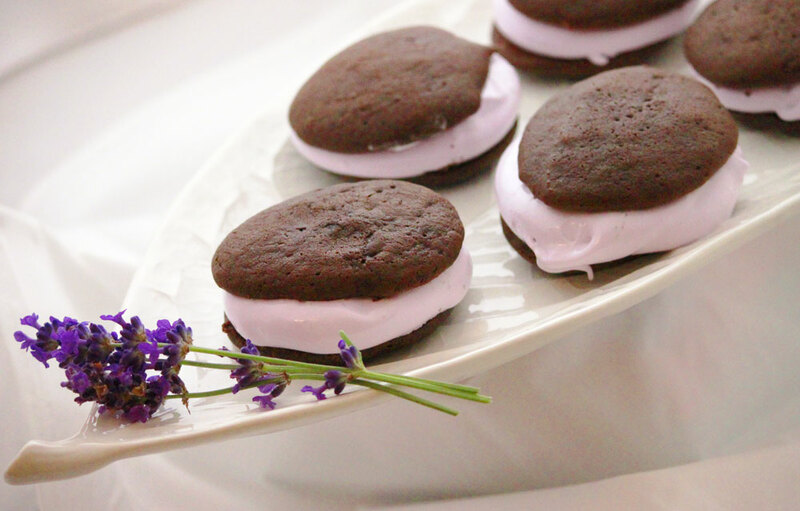 Make whoopie or whoopee (or both) you won’t regret it! 1. Preheat oven to 350ºF. Line 4 baking sheets with parchment paper. 2. Sift the dry ingredients (flour, cocoa, baking powder & salt) together in a medium bowl. Set aside. 3. Cream butter and sugar together in large mixing bowl on medium speed. Reduce speed to low, mix in egg and lavender extract until well blended. 4. Add flour mixture and buttermilk alternating, begin and end with flour and mix just until blended. 5. Drop 12 tablespoons of batter onto baking sheet about 1 ½ inches apart. Bake cookies for 10 to 12 minutes. To test for doneness, gently touch a cookie, if the cooking shows a dent, keep cooking. When the cookie springs back after you touch it, it is done. 6. Remove from oven and slide the parchment paper onto rack and let cool. Repeat this process with the remaining batter to make 48 cakes. 7. Meanwhile make the Lavender Marshmallow Filling (see below for recipe). 8. Using a metal spatula, remove cakes from parchment paper. Spread filling evenly on flat side of 24 cakes. Top with remaining cakes, rounded side up, to create 24 whoopie pies. 1. Pour 1 ½ cups of light corn syrup in a medium-sized saucepan. Cover and cook over high heat for 4 minutes. 2. While the corn syrup is reaching temperature, put egg whites and cream of tartar in a large metal bowl of electric stand mixer. With whisk attachment on medium-high speed, beat until soft peaks form. Turn mixed off. 3. Uncover pan and boil syrup until it reaches 230ºF (thread stage) on candy thermometer, 8-10 minutes. Remove pan from heat. With mixer on low speed, add hot syrup in slow steady stream along side of bowl, beating until blended. Increase speed to medium-high. Beat mixture until bowl is lukewarm to touch 12-14 minutes. 4. Turn mixer off, add powdered sugar, vanilla and lavender extracts, beat until smooth. 5. Turn mixer off, add one drop of food coloring gel. Beat until blended. 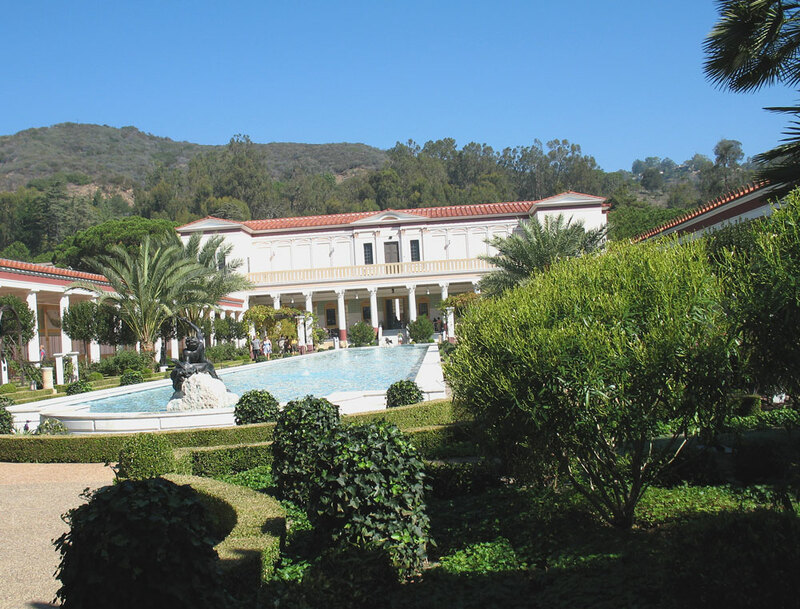 The Getty Villa, built in 1974, was modeled after Villa dei Papiri in Herculaneum, Italy. Much of the Villa dei Papiri remains are still buried because Mount Vesuvius erupted in A.D.79 , so many of the Getty Villa’s architectural details come from other ancient Roman homes in southern Italy near Pompeii. Never one to want to stay too long in a museum, I wanted to tour the Herb Garden. The Villa Dei Papiri would have been a long way from Rome, so it would’ve need to grow the food for its residents needs. Ancient Romans would’ve relied on the bounty of their garden for cooking, medicine and ceremony. 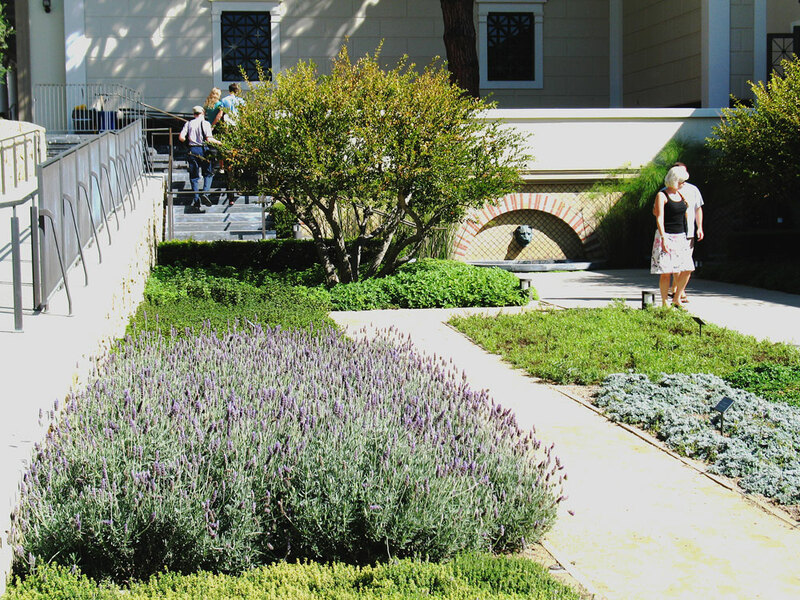 The symmetry of the garden added a feel of balance and order.The herb garden is planted at the Villa’s west side. Olive trees thrived in their place next to the Villa. 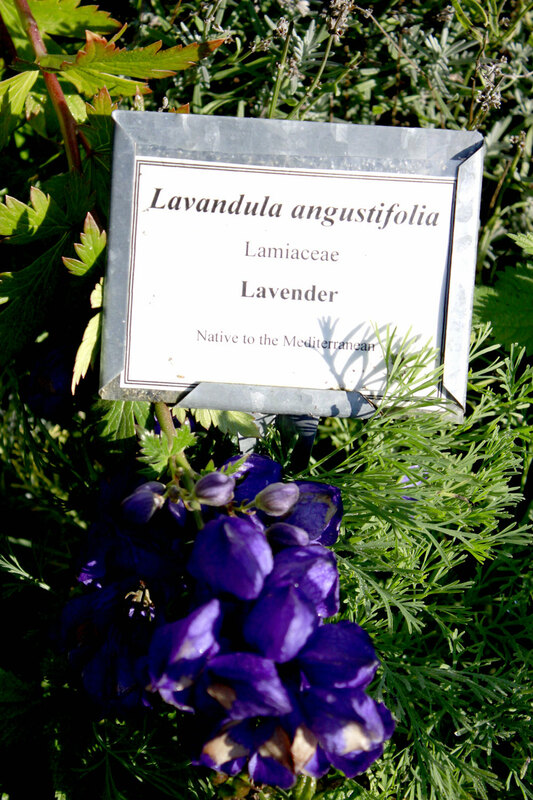 Along the walk ways, herbs –lavender, basil, calamint, oregano, thyme and horsemint grew. Fruit trees – apple, pomegranate, lime, pear, fig – stood at the far west side. I couldn’t help imagining what it would have been like to live in this house in ancient times, so much simpler in some ways, no cell phones, email or Facebook. What did they do with all that peace and quiet? Yesterday, I found a small package on my doorstop. I looked at the return address and discovered it was from my sister Chris who lives in Columbus, Ohio. I ripped the package open, and before I could see the contents, I could smell the fresh fragrance. Inside was a bar of soap. 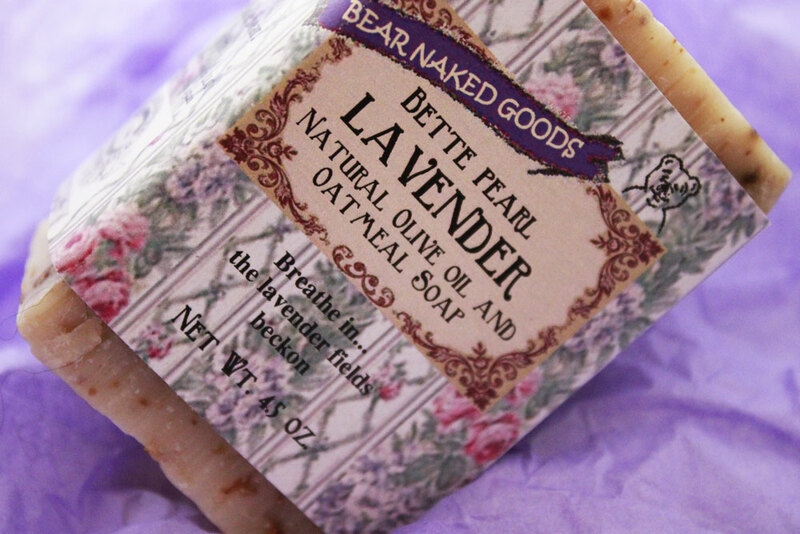 Not just ordinary soap, it was handmade with natural olive oil and oatmeal; its fragrance came from lavender. "Naked ....It's Natural": great tag line! 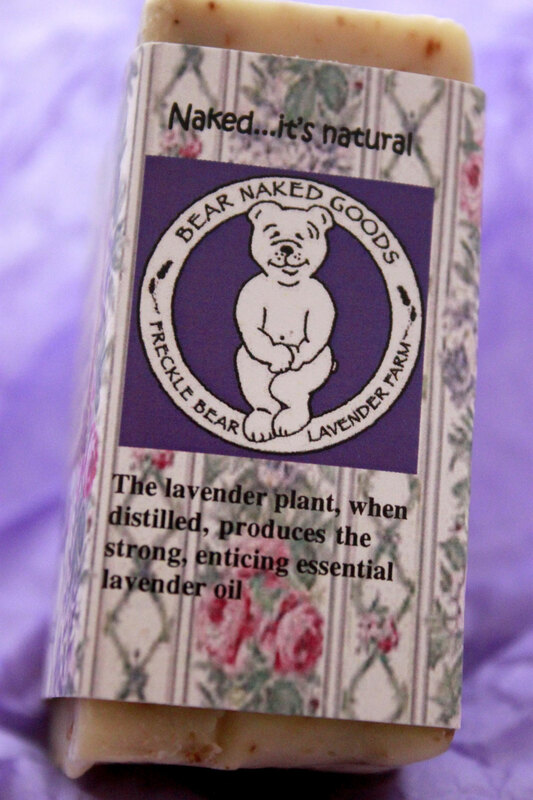 I smiled when I read that the farm’s name was Freckle Bear Lavender . What’s the story behind that name? I’m going to make it my mission to find out what it is. The soap was made by Bear Naked Goods. The person who dreamed up these names must be creative. Then I noticed the logo, and laughed. I’ve never thought much about soap. For most of my life, my favorite was Ivory Soap. When I took a bath, it would float around the tub making it easy to find. What it was made with never crossed my mind. Over the years, I’ve become more careful what I put on my skin. I answered, “yes.” Then she told me antibacterial soap was probably the culprit. She told me to stop using it. My hands were back to normal within a week. Now I’m even more aware of the risks of using antibacterial soap. Not only does it cause skin rashes for people who have sensitive skin, it contains potentially dangerous chemicals that can disrupt hormones and “may actually be aiding in the development of superbacteria.” Another problem is that these chemicals eventually get into our water supply, soil and food. I am grateful to lavender growers like the one at The Lavender Path for getting the word out about the benefit of using natural soaps. If you are like me, and have not thought much about soap, I ask you to consider switching to natural soap made with natural ingredients. Thank you, also, to my sister, for a thoughtful gift!